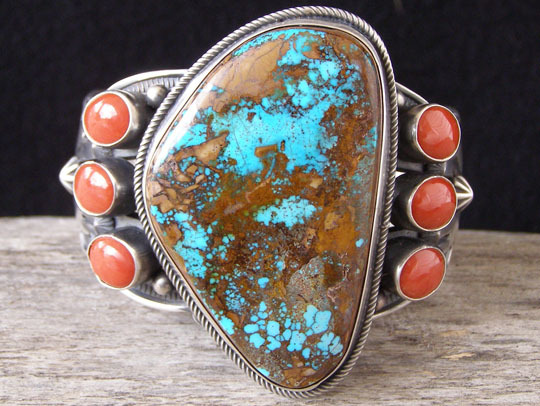 Aaron Toadlena Pilot Mountain Turquoise & Mediterranean Red Coral Bracelet size 7"
Aaron Toadlena, though very accomplished as a silversmith, has always had other full-time work and only smithed silver on a part-time basis. Having re-established contact with him in late 2010, we hope this leads to a constant flow of his work for our website. This gorgeous cluster is dominated by a very large free-form stone of natural, untreated Pilot Mountain turquoise from Nevada. This is the classically rich blue shade so common to Pilot Mountain "saw rock" (see note below). The fine, tight grain of this stone lends itself to a glassy smooth polish. Set in a 3/16" bezel, this thick stone still rises well above the bezel and is further accented by twist wire wrapping the bezel. Ovals of natural Mediterranean red coral are arrayed to left and right of the center stone. The cuff is split into five narrower bands behind the coral and center stone and is slightly convex on the sides. Aaron's inimitable large-pattern stampwork decorates the cuff to the terminals, while accenting stampwork traces the sculpted edges of the cuff. Hallmarked "Aaron Toadlena" and stamped ".925" signifying Sterling silver. Also stamped with Aaron's pictographic hallmark which is an open palm with the initials "AT" stamped on it. Pilot Mountain stone: 2 1/8" x 1 5/16"
Red coral: 6 ovals 3/8" x 5/16"
Width at center stone: 2 1/2"
Width of cuff: at ovals: 1 1/2"; at terminals 3/4"
Note on Pilot Mountain "Saw Rock": This type of deposit is referred to as "saw rock" because the turquoise deposit occurs in relatively thin veins. The rock is sawed in slabs and then the host rock is ground away until the deposit is reached. Though occurring in thin veins, this type of Pilot Mountain deposit is particularly hard and tight-grained precisely because it's been squeezed between other layers of rock for millions of years. It yields dramatic colors and patterns and is glassy smooth because of its fine grain and can be polished to a very high luster.